Oct 2016: An updated version of the code is on github, thanks to Gabriel Staples. The TV-B-Gone is a tiny infrared remote that can turn off almost any TV. A while ago, I ported the TV-B-Gone software to the Arduino; for details on the port and how it works see my previous post on the Arduino TV-B-Gone. Mitch Altman, the inventor of the TV-B-Gone, made some improvements to the code for a weekly TV-B-Gone constructing workshop in San Francisco at Noisebridge. If you're in the San Francisco area and are interested in the TV-B-Gone, you might want to check it out. Important: the pins have been changed around in the new version (to avoid conflicts with the serial port). Pin 2 is now the trigger switch, Pin 3 is the IR output, and Pin 5 is grounded if you want European codes. If you built an Arduino TV-B-Gone before and want to use the new code, make sure you connect to the right pins. To build the Arduino TV-B-Gone, follow the above schematic and download the sketch from github. My previous post on the Arduino TV-B-Gone has more information on wiring it up, if you need it. I've tried several different IrLED's but they all do the same. They do a fade blink every now and then while it's spamming the codes. Any idea why? I have the Arduino Mega. Thx for the nice conversion and upgrade. Version 1.2 runs fine on my arduino nano. I have to set digital pin 5 floating to to turn my european phi**ips tv on and off (place germany/eu ;-); the tv was bought in germany). If i ground digital pin 5 my tv just switches channels several times during a single run. I tried this with a fet and a MOSFET (IRLU 2905) as driver for my IR LED ->no changes. Drain connected to IR-LED with 39 Ohm in series to VCC/+5Volt). This works for a distance of several meters and really large IR LEDs or several ;-). With a floating digital pin 5 everything works like it should. It toggles tv off or on with every single run, no channel switching. Just one single action per run. Arduino TV B-Gone v 1.2 is running fine. I noticed that the "region blink", that the LED runs at first power up, is delayed by 3 seconds. I will report back the current draw on the ATmega in a few days. How hard would this be to adapt to use Ladyada's setup with two narrow beams and two wide beams? Do I have to use three AA batteries or can i just use a 9v? Thanks! I get those errors if I (mistakenly) unzip to sketchbook/libraries. Moved it to just sketchbook and the errors went away. Maybe your problem? Hey thank you for this port. I followed your design using a seeduino and it worked out better than expected. I get ~10m range at night. I built it into an old eyeglasses case and took it to the bars and had a lot of fun. Im using 4 AA's curently but a 9V doesnt seem to have enough (amps maybe?) to run the setup because the onboard led only flickers dimly and it doesnt seem to function. In order to make the whole thing smaller im probably going to use a smaller arduino and some AAA's. please execuse me b/c i'm a newbie. in your hand sketch, there's a value of "47" above the resistor connecting to pin 3 of arduino and another of "10" connecting to IR LED. are they 47 ohm and 10 ohm respectively ? Just a note for Mega users, use pin 9 instead of 3 for connecting of the LED driver circuit. Also change "#define IRLED 3" in "main.h" to 9. What currents Ib and Ic are occuring in the suggested circuit? Isn't the value of the 47 Ohms resistor too low? Or is everything o.k., because the IR Led is only pulsed? No luck with mine programmed with a 5V/16Mhz Arduino Nano and Pin 5 is floating. I can replace the IR led with a green one and see it blink the codes but the TV never goes off. I'll try another IR led and use a 5 volt power supply. But first, it didn't work with my Panasonic TV. The signal has to take about 2 seconds to turn off the TV, so I added a for-loop (3 times) for every POWER code. Now it works! no matter what i do my arduino uno and the sketchbook keeps getting errors with irremote sketches what do i do? excuse me, but I have some errors. hmm im curious. Would I be able to run this code properly on an arduino lillypad 8Mhz. I ask because I remember in the TV b gone the schematic referenced such an oscillator. I'm using an adafruit flora , but there isn't a pin 5 ,in it and this is the same code as provided by adafruit. ineed to change the region to EU for south america codes , the circuit looks and works but for the NA , how can i change it? I also tried several different IrLED's but they all do the same. The resistors are of 10K and 47K or 10ohms and 47ohms?? Tested with arduino 1.0.5 for an atmega 168. I want to run this on a 12Mhz clock. I tried changing DELAY_CTN to 11 but it doesn't seem to work. Would you have any advice on how to i could make it work for such a device (a Pro Trinket 3V/12Mhz from adafruit). Thanks for sharing that work :) !! The Arduino I'm using in the picture is a cheapo 5V Pro Mini, and I'm running the regulated 5V to the transistor Collector (though you could probably pull more power and get better IR range if you resized the resistors and ran power straight from the 9V battery to the Collector instead). My range is ~15 ft. Maybe a touch more if you have good aim. Ken, I want to let you know I have put your code on Github, here: https://github.com/ElectricRCAircraftGuy/TVBGone. This will hopefully make it easier for people to add to it if they wish, or edit it to port to other devices if they wish. I have made only very minor changes to it. I may have changed some pins or something (it was a long time ago I worked on it), and I added debouncing to the button (prob. not necessary, but I did it anyway to be thorough). Anyway, just wanted to let you know. For complete info people can read the readme at my link above. FYI Everyone, this code will NOT compile in Arduino 1.5.7 or later, due to the newer Arduino IDEs using a newer version of the gcc compiler, which has changed the way progmem is handled. I am using Arduino 1.5.6-r2 Beta to compile and upload this code to my Arduino. I keep getting an error saying StructIrCode is already defined or something, even when using the older software. (1.5.2 rev 2 beta). Please help me out with this i need to get this in for science fair asap. Ken, sorry for posting a slightly modified version of your code on GitHub without properly forking it. Somehow I overlooked your GitHub link at the bottom of your article above, or I would have forked from there. In either case, when I get the chance I'll help update to update your root version of the code to make it compatible with the current Arduino IDE, so that will be something I get to sometime. after const has been added? IF YOU GET NAPOWERCODES OR EUPOWERCODES MUST BE CONST,DOWNGRADE YOUR ARDUINO IDE. TEST IT. IT WORKS. Here is a link to the TV-B-Gone sketch which has been corrected and WILL COMPILE/RUN on an Arduino Uno @ 16Mhz, AND BUILDS IN THE NEW ARDUINO SOFTWARE. 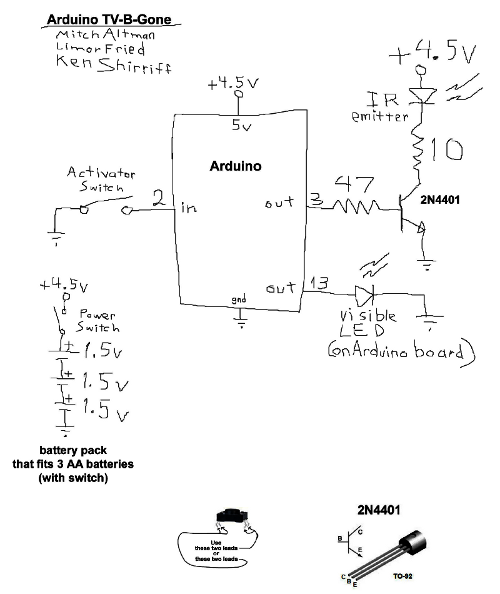 If you have been an able to build the sketch and run it on your Arduino UNO, TRY THIS -- IT WORKS! Just look, on the page, for, "3) You also need the TV-B-Gone Arduino Sketch"
And can't figure out how to fix them with my limited knowledge of coding, any ideas? Please help its a cool project but I cant get it to Work. version 1.0.3 (http://arduino.googlecode.com/files/arduino-1.0.3-windows.zip) of arduino IDE for windows, just uploaded it to my UNO R3 without any errors and it works great. i have used no transistors or resistors, just pinned anode of the IR LED to pin 3 and then grounded the LED cathode to GND right next to pin 13. turns every single TV that i have tested so far off, 30 years olds from sony to toshiba and high end samsung TVs. Ken, please post a link at the top of this article to the latest version of your code, just updated, here. Evan, Marti, Brett, Michel, Joseph, Amir, Mistifyer, and anyone else who couldn't get the code to compile, please see my link just above. I just updated the code on GitHub. Let me know via the GitHub Issues page if you have any problems. I tried this project a few months ago but came across many of the same errors as the people above. This new code works excellently and without any problems. Connect an IR LED to pin 3 (IRLED). Connect a visible LED to the pin 13 (or use the built-in LED in many Arduinos). Connect a push-button between pin 2 (TRIGGER) and ground. Pin 5 (REGIONSWITCH) must be left floating for North America, or wire it to ground to have it output European codes. I was interested in whether there is still benefit to using a transistor and resistor attached to the IR led? Can I use only microcontroller only of Arduino Uno? I made your modified project, and it works. I am in Europe, and the Europe link is in place. Until now, I only try it on my own TV, but sadly it doesn't work on it. The goal going this hack was to be able to shut off TV in front of us, because my 2 years old girl never see TV's and I don't want her to see until older. By the way now our gov. 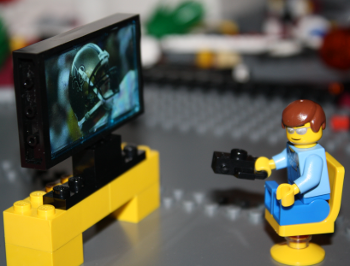 recognize Child under 3 should never see TV, but it's not yet illegal to let them see. Bring some addition and affect at lot child's brain enhancement. Thanks a lot for your work. Previous versions were not possible anymore to use on arduinos !